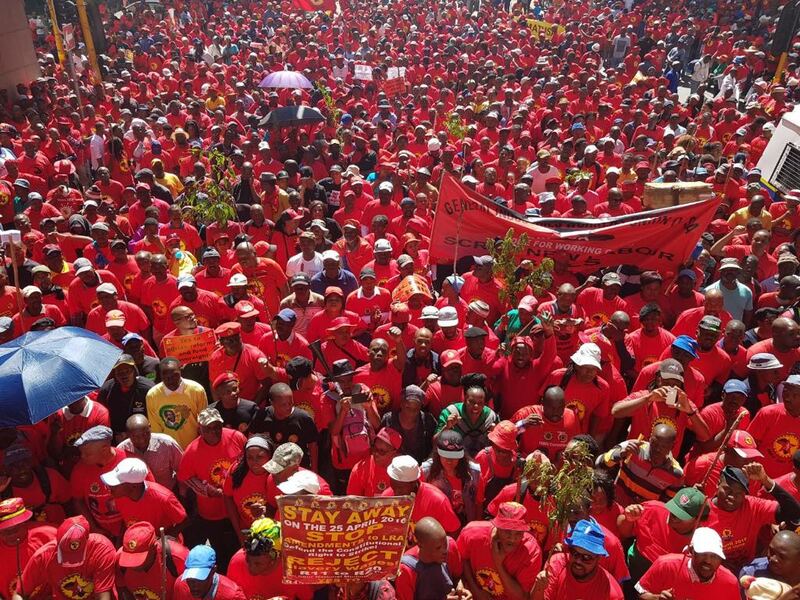 South Africa: The Streets are Red, Workers are on Strike! In a major show of workers power, thousands of workers, along with activists, unemployed youth and students joined the general strike called by the South African Federation of Trade Unions (SAFTU) on the 25th of April. Many workers from affiliated to other unions including those affiliated to COSATU, FEDUSA and NACTU also participated in the strike. The Congress of South African Trade Unions, COSATU (which is in alliance partnership with the ruling party, African National Congress) and FEDUSA (Federation of Unions of South Africa) had officially distanced themselves with the national stay away (strike), by actively mobilising workers not to attend the SAFTU planned strike. However, workers affiliated with COSATU, defying the communique, that warned them not to attend the strike, joined the national stay away. In a statement, NUMSA described the act of COSATU as “shocking coming from a once glorious Federation with an impeccable and rich history of struggle against injustices or unfair practices committed against workers and humanity at large”. The strike transcended the cities. In a small wine farming community in the Western Cape, Robertson, farm workers (from Commercial Stevedoring and Allied Workers Union – CSAAWU, an affiliate of SAFTU) organised themselves and also took to the streets to challenge the proposed minimum wage, and most importantly demanded better working conditions from their white bosses. Some workers held placards that read “to hell with R [Rand] 11, R15, R18 and R20 per hour.” Sectorial workers will be the most affected by the proposed amendments, namely farm workers and domestic workers. Farm workers will continue to earn R18 per hour and domestic workers will earn R15 an hour, only in 2020 will they get full minimum wage. In expressing contempt and disgust to these changes, one worker held a placard that read “we reject slavery wages”. 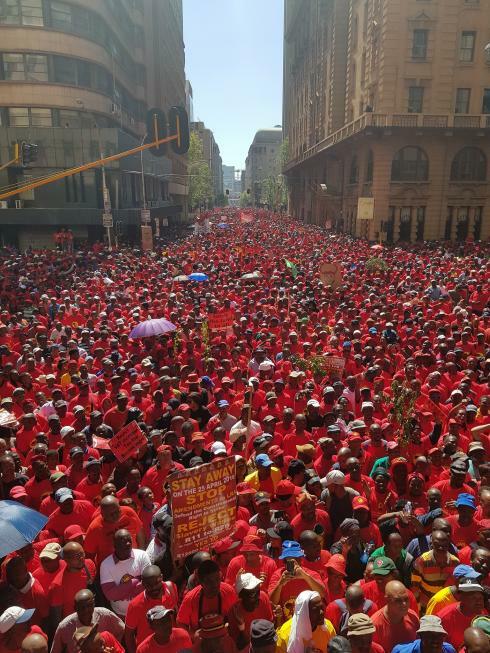 In an official memorandum handed over to government, SAFTU submitted that the amendments “… represent the most glaring attack on workers since the dawn of democracy and are no different to those introduced in Britain by the late Prime Minister Margaret Thatcher and Ronald Reagan in the United States. Their project, just like these Bills, was designed to disarm and emasculate workers”.